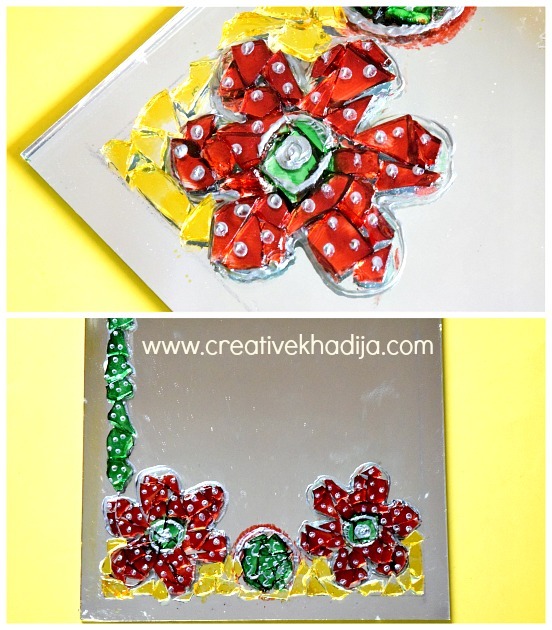 Hey girls, As you know I like glass painting & have shared many tutorials about it on the blog. So recently while organizing my craft room shelves, I saw my glass paints are getting dry. Oops, it’s been long I’ve used glass paints. 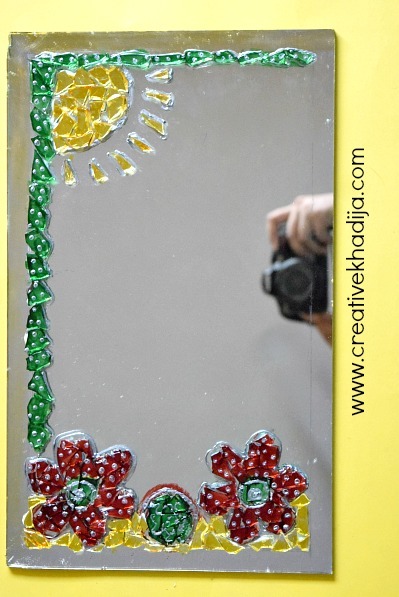 I had a frameless mirror piece somewhere in my craft room. 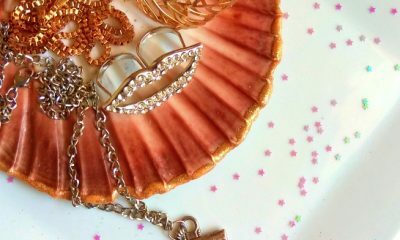 I quickly find out that piece & thought to decorate somehow. Today I will show you how I did it. Also those paints were half dry, better use them as soon as possible. I hope you will find my today’s tutorial simply interesting! 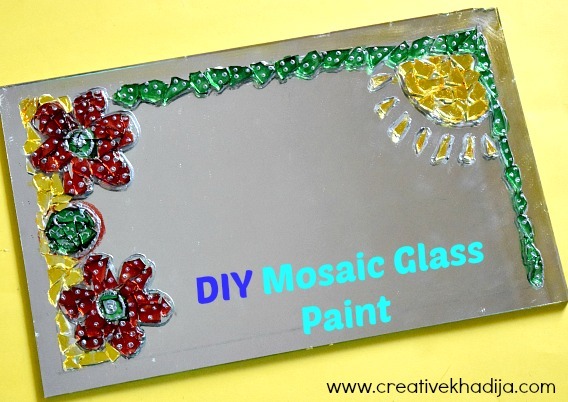 Let’s have a look How To Make & Design Glass paint Mosaic Wall Art. Isn’t it a colorful glass paint wall art? This time I have used some mosaic technique. As the paints were a bit dry, so I doubt they will not be giving a smooth brush stroke on the mirror. Instead of painting them on the plain surface of the mirror, I paint it on mosaic pieces. See more steps below now! 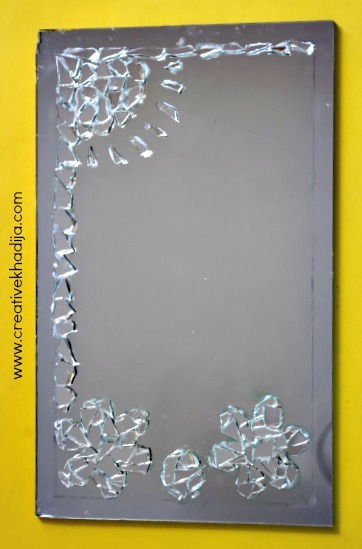 Mirror or glass broken pieces in half inches in size. Step One: How to crack mirror pieces for the mosaic. You can see some more instructions in this archive post from 2012. 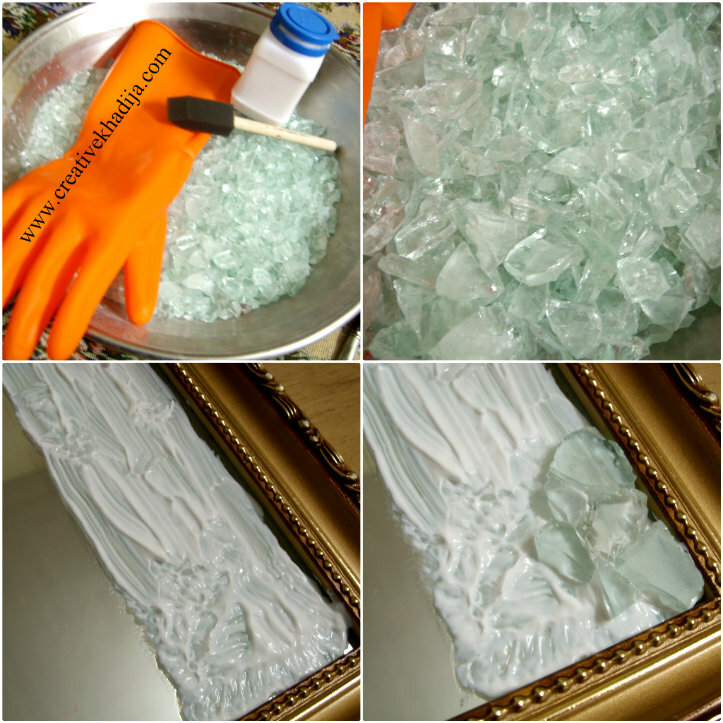 In the first step we will break some glass pieces into small chunks. With the help of a hammer. You don’t need to break it hard, just a little hit will be enough. Wrap a piece of mirror/glass in several folds of brown paper sheets. Keep kids away while breaking it. Be sure to wear rubber gloves, so your hands will remain safe from glass scratches. Then slowly hit the mirror piece with a hammer & collect desireable sizes of glass pieces. Be sure to dump the very small pieces in the garbage carefully. Wrap those crushed waste pieces in paper & any plastic bag then throw in garbage box. 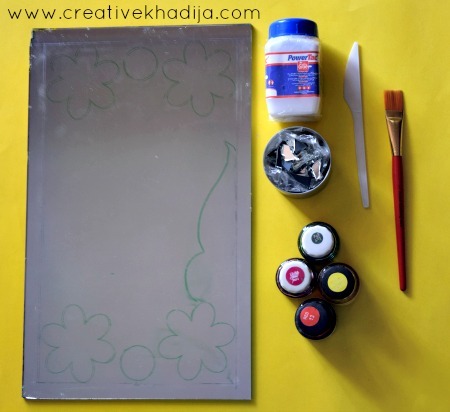 Draw any design on the mirror with the help of a removable marker. Do not use permanent marker otherwise it will be difficult removing it from the mirror later. Start filling the drawing part with mirror/glass pieces. 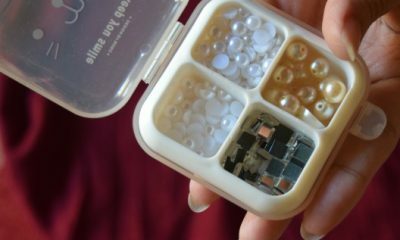 Apply glue with a brush & fix the pieces carefully. Be sure to wear rubber gloves during this process. When complete the filling of design with mosaic pieces pasting, then leave it for an hour or two until it gets completely dry & fix well. After applying the paints, I use the led outliner on the sides of my design. then also I put some dots on the flowers to hide irregular strokes of dry paint. Well, you know the struggle is for real? Capturing a photo of mirror wall art while hiding this & that(especially yourself) is not an easy task. Here is a glimpse of my hand, camera & running ceiling fan. Anyways, do you like the way I’ve designed a mirror wall art again? Now I am not going to buy new glass paints until I will finish previous colours. 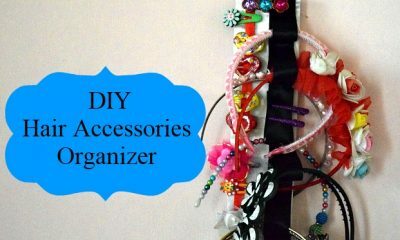 It truly feels bad when your any craft supply goes to garbage as waste. Isn’t it? 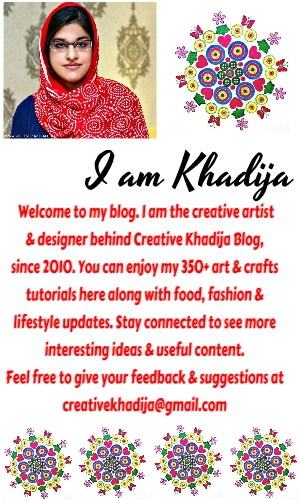 If you have any question or suggestion related this painting, feel free to write me. If you want to buy this, you are also welcome! Feel free to use Contact Us form for any question. Be sure to enjoy my other glass painting wall arts tutorials. 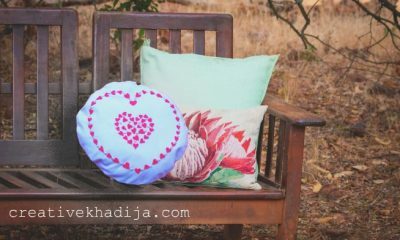 Share the post on your social media networks to show some crafty love :) Have a great day! wonderful! I love your technique of the glass mosaic on top of a mirror. The little dots add a lot, too – so cute! I agree, having patience while a piece is drying (or baking) is the worst. Thanks for the inspiration, Kiran! Thank you for appreciating :) So nice of you! Have a great Monday. I learned something new from this! Thank you. so cool! 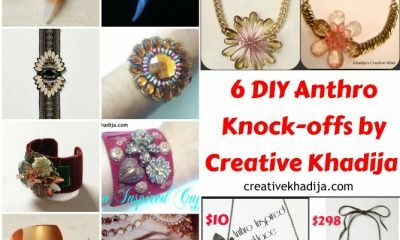 Thank you for sharing the tutorial at The Really Crafty Link Party this week. Pinned!